Rain, Hallelujah, if that's what you call it! Well, at least we saved on one night's irrigation application except for some tees and the greens. Only received 1/10" of rain this morning. Not nearly enough but we will take what we can get. We had nearly an inch on May 7th and a pittance of .05" on 5/20. At least a few days of cooler temperatures will help us save on the water bill. 3,000,000 gallons pumped into the lake over the last 10 days to offset our irrigation cycles. Running water like its late June into early July. This means everyone needs to chose Glen Echo for a dinner outing over the next few weeks instead of one of your favorite Friday or Saturday date night favorites. With the early heat, dry conditions and increased play, traffic patterns involving golf carts have been emerging that are placing extra stress on our turf and quite simply do not look good and detract from the beauty of our golf course and the hard work of our staff. From our teeing areas, walk paths are created for our walking golfers to help reduce the amount of dew that they must walk through to get to their golf balls, hopefully in the fairway. These paths should not be used by golf carts. The turf is cut at a height of 1.25" and cannot handle the stress of the carts driving onto these paths. 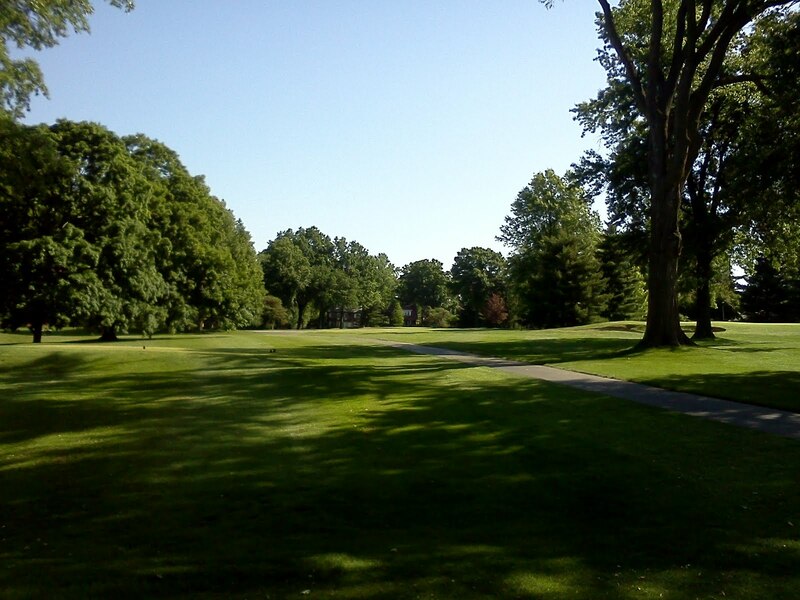 Also, the areas in front of the tees are sometimes large expanses of turf which area stripped by our rough mower and look very good without golf carts creating traffic patters throughout the area. Proper entrance into a fairway should be from the side of the cart path that runs along the fairway, not directly off the tee area. This is a large area that can help reduce the amount of wear and tear on our rough. 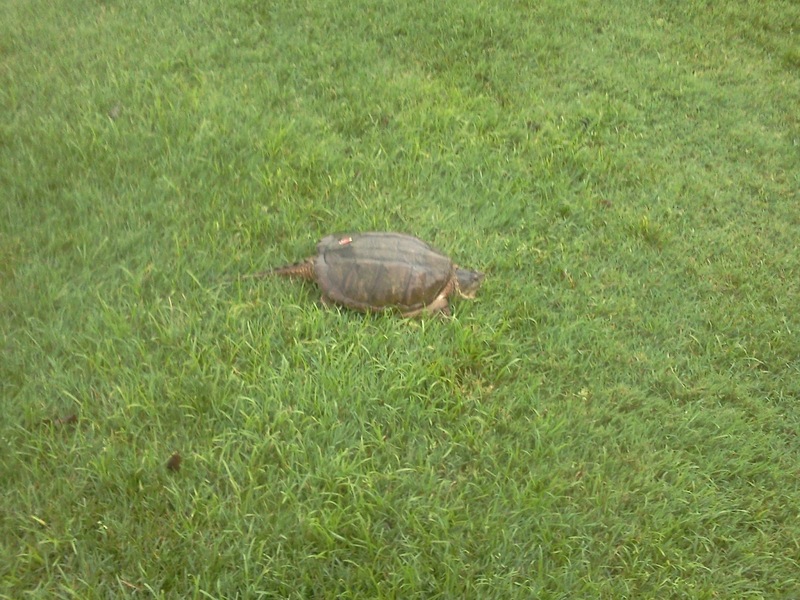 Also, if you see wear patterns emerging, take a different route to get back to the cart path. Golf carts seem to travel the same path like cattle do out to a field, the only difference is our members and guests can make a choice from the knowledge that changing patterns will help reduce wear and tear by altering paths from time to time. In the picture below. The proper way to enter the fairway would be up along the tree line on the right background where you could drive directly across to your ball. Any opportunity to keep the cart on the path encourages better turf conditions and will save our operation money as well as improve the looks of our great golf course. The walk path leading to 15 fairway. 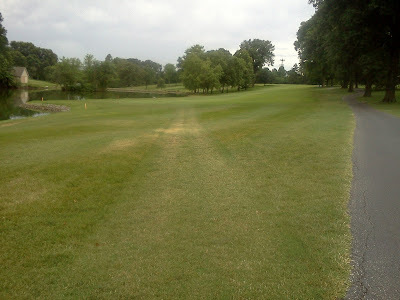 The cart path tracks are ugly and unsightly and create added stress to the turf. This requires more water and fertilizer to help the turf recover. We have placed cart directional arrow signs at the entrances of these paths to discourage use of these areas by golf carts. Your cooperation is greatly appreciated. Hope you' ve had a chance to be at the club this weekend. Members, guests and some good lady players from all over the country have been challenged by some great conditions. The ladies are here for a US Women's Open qualifying tournament on Tuesday. We are needle venting greens today. This process uses are large aerator with a 1/4 solid venting tine. No soil. Green is rolled when completed. Should not effect ball roll. Process helps our greens exchange gases. O2 which is healthy for roots in place of CO2 which can build up in the soil creating a not so healthy enviroment for our green's root system. After our tournament ended at 530 or so last night, we top dressed the greens with sand and then sprayed them with a wetting agent and watered it in. The wrtying agent will assist us in keeping moisture consistently throughout the green profile during most of the summer. Happy Mother's Day to all of the ladies. I hope you have a good day with your families and get to relax a little bit today. Split duties for me today between Beth and her mother and my mother. There are a lot of little details that are performed on a regular basis by our grounds crew at Glen Echo besides the usual daily mowing by large and noisy machines. 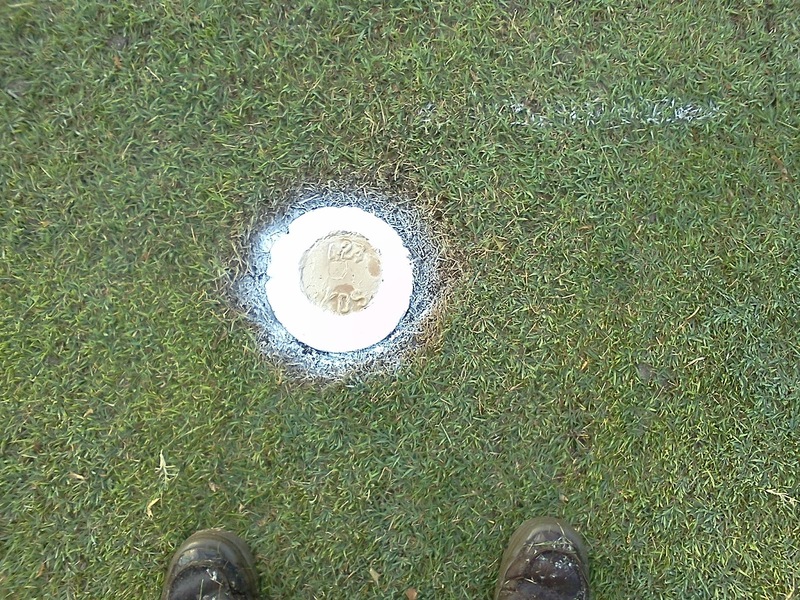 Some of these include painting the designated yardage markers for each specific tee marker. Yardage stripes on cart paths to help give you a general indication of how far you are from the green in case you are not near a sprinkler head yardage marker. These activities are usually completed in the early part of the season and usually before the Invitational. Trimming the other 1,500 sprinklers heads, valve and electrical boxes around the golf course on a regular basis. We try to get the green, tees and fairway heads cleaned on a monthly basis. 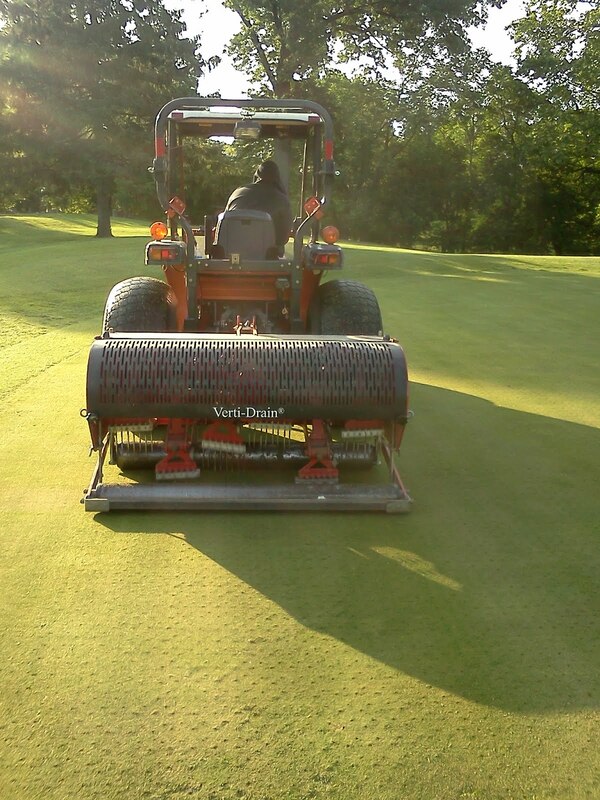 The outer heads usually get trimmed once or twice per year and the valve boxes that assist us in isolating fairways, tees and greens from other areas of the golf course usually 1-2 times per season. The bench/ball washer areas are treated with preemergent and weed control and are then mulched twice per season. As you can see, the little things aren't necessarily things that you would notice on a regular basis but if they were not completed, they would be noticed. 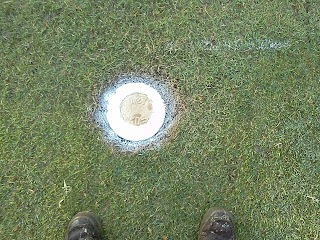 The white yardage marker for hole #16 freshly painted and trimmed. Beautiful weather, staff has been working diligently this week putting the place in shape. Grill out tpnight on the patio. Could not ask for anything more!!!!! 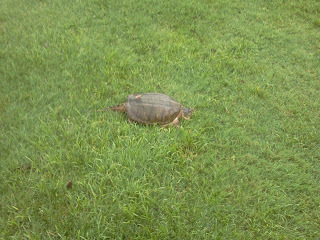 Alligator snapping turtles frequent the four lakes of Glen Echo. Every mid-spring, the females make their journey across the course to lay eggs in the creek along holes 1-2. What a long journey for those short little legs If you drive in from the front gate, you might be on the lookout for turtles as they cross the road looking for a nesting site. They are not afraid of humans and or the vehicles we drive and will literally turn and face the object that is impeding their travel and or come into their field of vision. The long range tee will be closed on May 5-6 due to Metrolink construction. 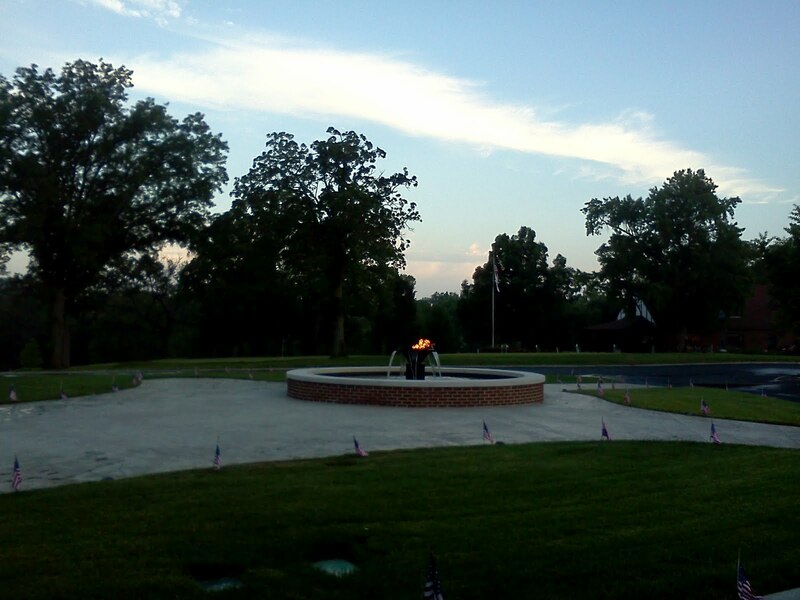 The short range tee will be open for your use this weekend. We appreciate your understanding during this closure. The club was compensated for the closing of the long range tee.